Wow. Amazing .hired the ministry of sound inflatable night club for my daughter's 16th birthday . BEST THING EVER . This is amazing . Great idea great service .Very friendly . Efficient and reasonable price . It made my daughter's party the best 1 ever .Can't thank them enough . Well recommended thankyou . First time I have ordered a bouncy and highly recommend this company. Excellent service from start to finish and good prices too. 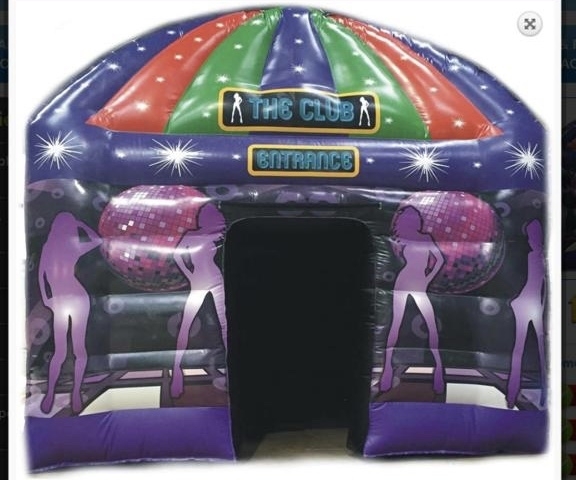 Another new product is our Disco themed inflatable nightclub. Slightly smaller in width than our other two nightclubs this one is perfect for the smaller gardens. A great idea for parties at the home with the feel of being in a nightclub. Comes included with the hire price is a Bluetooth speaker, disco lights and overnight hire and a thick hardwearing groundsheet!